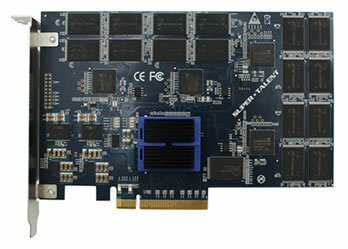 Super Talent reveals the RAIDDrive upStream, a new line of enterprise-class PCIe SSDs with capacities of 220GB, 460GB and 960GB. SSD solutions were first introduced as 2.5” SATA replacements for existing Hard Drives. These transitive solutions have clearly demonstrated the benefits of SSD technology we know today. SSDs are faster, use less power, are more rugged and are more reliable than HDDs but the 2.5” form-factor limited their capacity and the SATA interface has again limited the available throughput. The new RAIDDrive upStream breaks the mold and brings SSD technology directly to the PCIe bus. No longer limited to a 500GB maximum capacity by the predetermined 2.5” form-factor, upStream can support a full 1TB of storage. And no longer limited to 550MB/s by the SATA III bus, upStream delivers up to 1GB/s of performance. The upStream is a perfect addition to any workstation running a variety of disk intensive applications. It’s perfect for Animation, Simulation, CAD and Sorting & Searching large databases. When time is money, upStream quickly pays for itself and in the hands of creative professionals, upStream facilitates the creative process by enabling creative professionals to work fluidly, unencumbered by the long delays that sometimes result from simple commands. By now, many of you have heard of SandForce™, a name synonymous with high performance SATA based SSDs. Now imagine four (4) SandForce SSDs working in conjunction and their combined performance focused solely on your project; that’s the upStream advantage. It’s four SSDs in a RAID array driven by an LSI RAID controller. Discover how upStream can accelerate your workflow by contacting Super Talent today!